Want ArcGIS for Linux? Vote for it! In the recent years, we have seen several proprietary software being ported to Linux, probably based on user demand. Few big names which have a Linux version include Mathworks MATLAB, Autodesk Maya, CATIA etc. Geospatial software vendors too did not stay behind. We have ArcGIS Server, Geomatica and FME Desktop to name a few. This being the situation, there has been always a wish in the minds of geospatial community, particularly amongst the Linux fans, that ArcGIS must come to Linux. This never happened. But now there is a small hope. 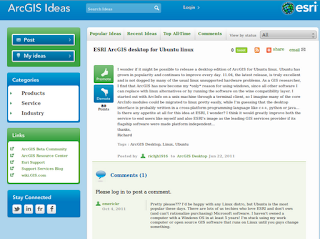 I came across this interesting community portal by Esri, ArcGIS Ideas. This site provides a platform for users to submit ideas and enhancement requests regarding Esri products, websites, training materials and more. Users can vote for existing ideas or propose new ones and even comment on previously submitted ideas. Depending on various factors like adherence to the ArcGIS product vision, Quality and completeness of the suggestion, feasibility and popularity of the idea, these ideas may find the way to the “Under Consideration”. Esri's moderators will take action regarding this. Once an idea reaches active consideration state, depending on confidence level, it will find its route to "Implemented" category. The process seems to be very democratic. Though I have seen smaller products seeking ideas from regular users, this is probably for the first time I am seeing a giant like Esri coming up with an initiative of this kind. Out of the total 3504 ideas submitted so far, 149 have been implemented and 146 are under consideration. Though this looks small, the system has lot of potential. When every GIS user starts submitting ideas and voting for them, wonders can happen. Amongst several ideas present at ArcGIS ideas I liked one the most - ESRI ArcGIS Desktop for Ubuntu Linux. Mr. Richard who posted the idea, claims that the only reason he uses Windows, is to use ArcGIS. I am pretty sure this would be the case with many. When I was studying for my Master's I too had the same problem! Richard believes that, as ArcInfo earlier used to run on UNIX porting ArcGIS modules won't be difficult. Also as the GUI might be written in a cross-platform programming language, migrating it might be easy. Till date, the idea has garnered 80 points and I appeal to entire GIS Community, particularly Linux fans to vote in favor of this idea. Each vote can make a difference in bringing a leading GIS software to Linux. All it takes to vote is a Esri Global account which can even be created for free. As a huge fan of Linux OS, particularly Ubuntu I always long to see commercial software supporting Linux. Given the fact that Canonical, makers of Ubuntu strive hard to see Linux adopted in every enterprise segment Esri could expect their support too. We’ll probably start moving more towards supporting the Mac at the next release after ArcGIS 10.1. So if everything goes well we may see ArcGIS running on Linux and Mac anytime soon. When will ArcGIS run on a Mac?